PATLab test is the laboratory version of PAT test, an automated test designed to assess the antioxidant capacity of plasma by measuring its ferric reducing ability. Ferric to ferrous ion reduction causes a color change that can be photometrical assessed. PATLab test was developed by Prof. Umberto Cornelli of Loyola University Medical School of Chicago and it incorporates significant biochemical and technological improvements compared to its predecessor, BAP test, by reducing the interference of plasma phosphates in determination of plasma antioxidant capacity and by reducing the processing time to only 1 minute. PATLab test is designed to be performed on general spectrophotometers usually available in laboratory or research facilities. 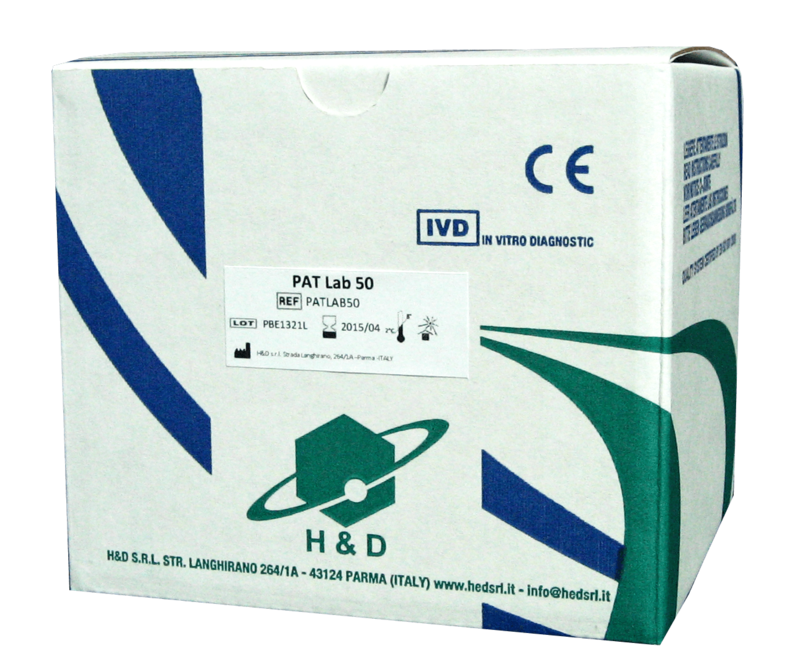 PATLab test is commercially available as PATLab50, PATLab100 and PATLab200 test kits. FeCl2 is the ferrous chloride obtained by the reducing activity of BP(e-). By photometrically assessing the intensity of discoloration, the amount of reduced ferric ions can be adequately evaluated, thus allowing an effective measurement of reducing ability or antioxidant capacity of tested blood plasma. Preliminary data from healthy subjects indicate that normal value for PATLab test is between 2,200 and 2,800 U. Cor. (Cornelli Units), where 1 U. Cor = 1.4 µmol/L of ascorbic acid. Values lower than 2,200 U. Cor. indicate a reduced biological antioxidant capacity and require clinical attention. PATLab test provides valuable information about the antioxidant status in healthy people, as a mean to identify redox imbalances and to prevent oxidative stress, as well as in subjects diagnosed with oxidative stress-related diseases, as a mean to monitor the efficacy of antioxidant therapies. As a mean of prevention, PATLab test may be routinely performed on all clinically asymptomatic subjects that are exposed to factors able to reduce physiological antioxidant plasma defenses such as polluted environment, inadequate exercise, unbalanced diet or chronic inflammatory diseases with reduced absorption of nutrients. Since chronic oxidative stress is at the root of multiple chronic and degenerative diseases, rebalancing the redox status in the patients’ system must be a priority of any treatment plan. PATLab test provides valuable feedback about the evolution of the antioxidant defense in subjects undergoing specific therapies, either alone or in combination with antioxidant therapies. The measurement of plasma antioxidant capacity is influenced my many factors and variables, such as diet, physical activity, presence of chronic disease, genetics and phosphates content. It has been demonstrated that phosphates in plasma may overestimate the antioxidant capacity of plasma and create erratic results due to their high concentration variability. Among mineral complexes, phosphates are the only capable to bind iron and interfere with antioxidant capacity measurements, therefore current methods available for assessment of plasma antioxidant capacity based on iron reduction can be influenced by the plasma concentration of phosphates, leading to an overestimation of the plasma antioxidant capacity and misleading results. The overestimation of plasma antioxidant capacity can be addressed by using the right amount of zirconium salts that have the ability to bind to plasmatic phosphates, without causing their precipitation. Unlike other commercially available tests,PATLab test reagents have in their composition a zirconium salt that binds plasma phosphates, avoiding phosphates’ interference in the Fe3+ reducing reaction and therefore enabling an accurate and repeatable assessment of the reducing capacity of plasma. PATLab test reagents also feature a stabilizer aimed to avoid uncontrolled reactions and preventpolarity modifications of the Fe(SCN)3 compounds, enabling the formation of stable molecules that can be further quantified by spectrophotometric readings at 505 nm. The stabilizer’sproperties makealso possible that PATLAB test reactions are pH-independent, avoiding plasma proteins precipitation, a reaction that usually occurs in acidic environments. One of the major features of the FRAS system is the integration of d-ROMs test and PATLAB test values into a single value – the Oxidative Stress Index (OSI), that offers a simple and convenient, yet comprehensive picture of the oxidative stress status in a biological system. The OSI index is based on specific standardizationsof the results of the d-ROMs and PAT tests, despite the different measuring units and value ranges of the two tests. Certain arithmetical transformations were used to determine the final OSI values so that an easy and convenient interpretation of the results is possible. The OSI index does not substitute the d-ROMs and PATLAB test results, but it complements and enhances their value.